Licensed Acupuncturist, Chinese Herbalist, and Nutritional Therapist. I specialize in treating women’s health and fertility, pregnancy care, labor support, and post partum support. Other specialties also include resolution of seasonal allergies, food sensitivities, as well as digestive support. I also specialize in pain relief including arthritis, auto immune disease, sports injury, and auto accident injuries. I also work with hospice care,and palliative planning care for those facing serious or terminal diagnosis. Providing Effective and Personalized Healthcare. At Point to Health Acupuncture I offer personalized, compassionate, and effective healthcare. I offer the modalities of acupuncture, Oriental medicine, herbal medicine, nutrition, yoga, reiki, and bodywork. I have found that using these modalities in conjunction with each other provides lasting results. I also strive to help patients have the tools and education they need to do home care, and maintenance care on their own. My goal is to help people be pain free and reach their optimal health potential. 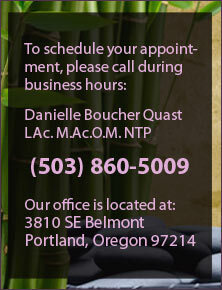 Call today for a free consultation to see if Point to Health Acupuncture is right for you.